Ex-oil tycoon Mikhail Khodorkovsky has landed in Berlin, a German Foreign Ministry spokesman has said in a statement. 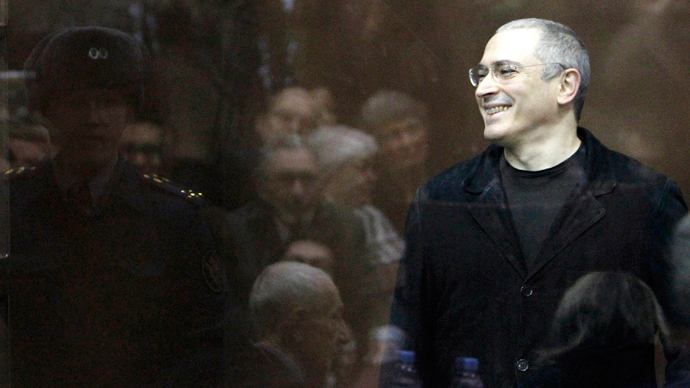 Khodorkovsky has been freed from jail after a decade of imprisonment as President Vladimir Putin granted him a pardon. "I can confirm that Mikhail Khodorkovsky landed in Berlin Schoenefeld [Airport] today," a ministry spokesman told Reuters. It appears Former FM Hans Dietrich Genscher helped with #Khodorkovsky visa process. 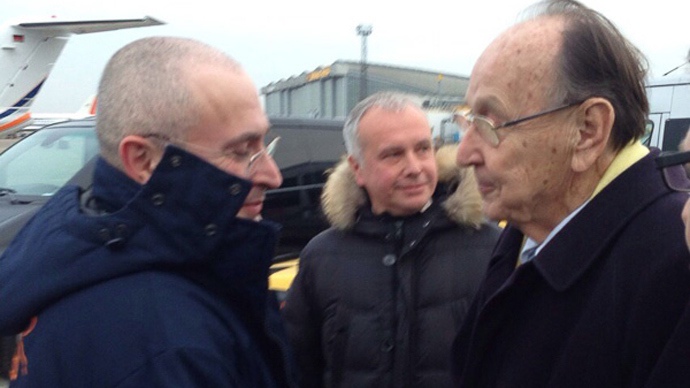 Former German foreign minister Hans-Dietrich Genscher has confirmed that Khodorkovsky arrived on a private jet to Berlin and that he personally picked him up at the airport. According to German DPA news agency, Genscher asked the German company OBO Betterman to provide an airplane. The purpose of Khodorkovsky’s trip to Berlin remains unclear. The Federal Penitentiary Service said he had flown to Germany, where it said his mother is undergoing medical treatment. However, Marina Khodorkovskaya, 80, denied that she is in Germany in an exclusive comment to RT. “No, I am in Moscow,” Khodorkovsky's mother said, but added that she and family members were “ready to leave, but haven’t decided yet what to do.” When asked if she has talked to her son, she said: “No, I can’t talk to him – he has no phone.” She said that she does not have any new information besides what she “hears from radio [reports].”Reports on Khodorkovsky’s departure to Germany appeared hours after he left the prison. According to the Federal Penitentiary Service’s statement earlier in the day, Khodorkovsky had filed a request to issue him travel documents. “As he was being released, Khodorkovsky requested that he be issued the documents required to travel abroad. After the release, he took a flight to the Federal Republic of Germany,” the service’s press service said. The prison service did not provide details of the flight that it said took Khodorkovsky out of Russia. But an RT source at a local airport cited aviation chatter as saying that Khodorkovsky had flown out of the town of Segezha, where his prison is located, in a helicopter. On Friday afternoon, Khodorkovsky was released from a prison in the Karelia region, nearly 1,000 kilometers north of Moscow, hours after a presidential pardon was signed. The degree cited humanitarian concerns as the reason for releasing the businessman after a decade of imprisonment. 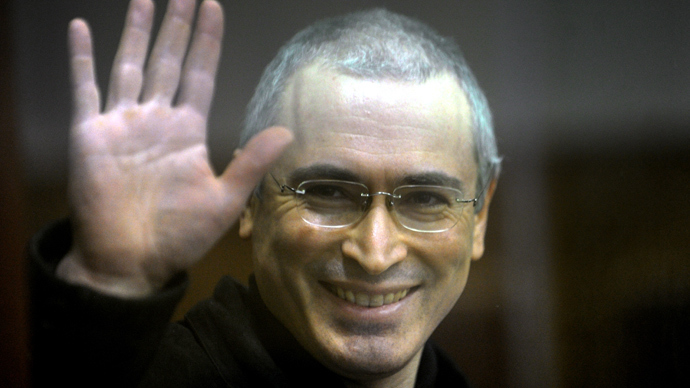 Khodorkovsky, once the richest man in Russia, was arrested in 2003 and charged with tax evasion and fraud. In 2010 he was prosecuted and found guilty of money laundering. He was due for release in August 2014 after two separate Russian courts reduced his sentence. Germany’s government has issued a statement saying that Chancellor Angela Merkel has welcomed Khodorkovsky’s release. Former FM Genscher described the move as "significant and very encouraging". The statement issued by Genscher's spokesperson revealed the joint efforts of both the former FM and Chancellor Angela Merkel aimed at securing the release of Khodorkovsky. Genscher had met Putin in person twice to talk about Khodorkovsky and Markel “has repeatedly lobbied the Russian president for Mr Khodorkovsky's release" over the last few years, the official statement said.